Today we are happy to announce the release of a new free extension – Activity Logs for MainWP. With this extension, MainWP users can keep an activity log of changes that happen on their MainWP dashboard, and also see the activity logs of all child sites from one central location – the MainWP dashboard. Before highlighting the features of this new extension we’d like to introduce MainWP, for those who are not familiar with it. MainWP is a WordPress management suite developed to be the most effective, self-hosted WordPress central dashboard. From the MainWP dashboard a user can control virtually all aspects of WordPress management including updating all of their sites with just one click of a button, schedule automated backups, monitor their sites, manage content across their network and much more. 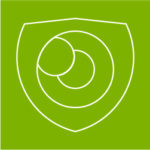 Visit the MainWP website for more information on this great, free WordPress management system. Why Did We Do The Extension For MainWP? MainWP is a leading WordPress management solution, and is developed by some of the most experienced people in centralizing management of multiple WordPress websites. So there was no question if we wanted to work with them. This project was really exciting for us because we’ve learnt a great deal from them, and the end result shows that! A few months back we announced that our activity log plugin for WordPress keeps a log of changes done on child sites from the MainWP dashboard. This was the first phase of the integration project. In the second phase, which we are announcing today, we developed an extension with which you can view the activity logs of all child sites from one central location – the MainWP dashboard. 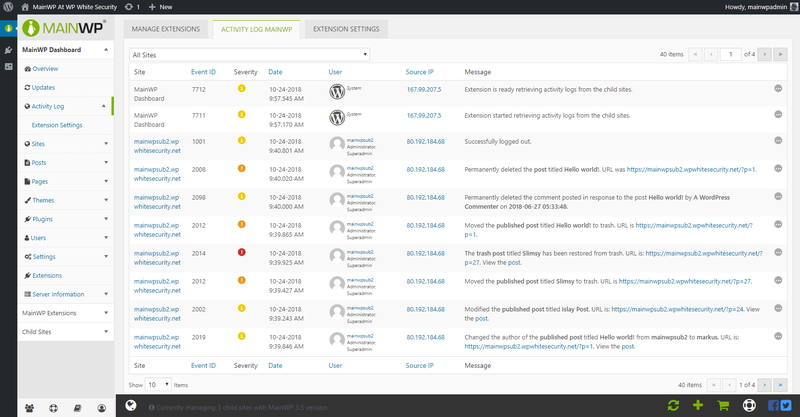 Getting started is really easy – install the WP Security Audit Log plugin on the child sites and the Activity Log for MainWP extension on the MainWP dashboard. The extension uses MainWP’s own secure and bandwidth efficient communication channel, to ensure there is no tampering of data and it is transferred as fast as possible. Adds, starts, pauses or deletes a monitor in the Advanced Uptime Monitor extension. Refer to the list of events & event IDs for the MainWP activity log for a complete list of changes that the extension can keep a log of. Refer to the getting started guide for the MainWP activity logs for an easy to follow guide on how to get started. And refer to the configuring the MainWP activity logs extension for more information on what can be configured in the extension. If you have tried the Activity Logs for MainWP extension we’d like to hear back from you. Let us know what your thoughts are and if you’d like to see a new feature. All feedback is welcome.